Kevin Anderson and John Isner were tired and, understandably, a bit cranky after playing a 6-hour, 36-minute men’s singles semifinal match at Wimbledon on Friday. Anderson, who won the fifth set 26-24, appeared to be more annoyed. He criticized the lack of a deciding-set tiebreaker at Wimbledon, the Australian Open and the French Open. The U.S. Open does use a tiebreaker after 6-6. 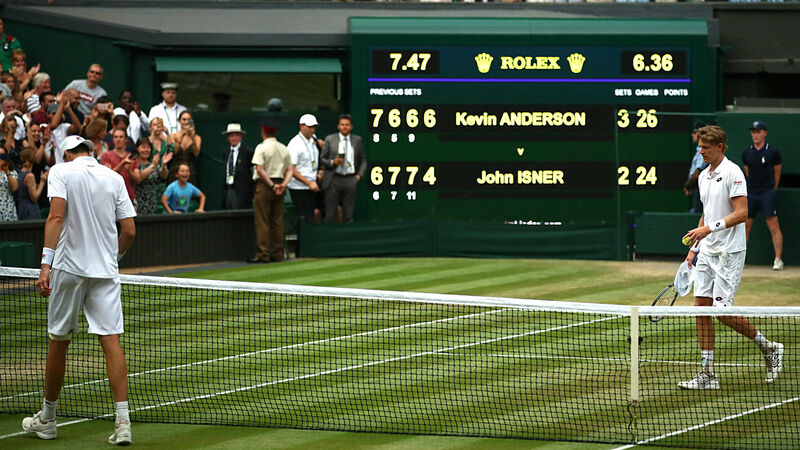 The Anderson-Isner match, the second-longest in Wimbledon history, marked the second time in a 48-hour span that Anderson had played a marathon fifth set at the All England Club. He defeated Roger Federer 13-11 in the decider of their quarterfinal match Wednesday. Isner played in the longest Wimbledon match (and the longest match in tennis history) in 2010, a three-day affair vs. Nicholas Mahut that ended with Isner winning the fifth set 70-68. The official time was 11 hours, 5 minutes. According to The Score’s report, Isner suggested after Friday’s match that a tiebreaker could begin after a fifth set gets to 12-12.